So, you want to cook a good cheeseburger and you think just because you have a Big Green Egg it will be good? Well, you are probably right, your cheeseburger will be delicious! However, there are a some things you can do to help produce spectacular results. The idea for this blog post started after reading a recent article: 10 Commandments for the Perfect Burger by Anthony Bourdain. The list is made up of simple rules that depart from the recent trend of mammoth burgers you see in your Instagram feed daily. For me, it was time to make some burgers and put these 10 simple rules into practice. Now sit back, grab an ice cold Stella Artois, and enjoy the post: Big Green Egg Cheeseburger Throwdown. First commandment: Thou shall keep it simple isn’t as easy as it sounds. After reading Anthony’s article, what struck me was the very important question… “am I making this burger better?” Fighting the urge to put a monster burger together is hard these days especially if you are a food photographer. But making a simple cheeseburger that can stand on its own is an art worth mastering. Second commandment: Thou shall use a potato bun is a no brainer as potato buns are the best thing to happen to burgers since sliced cheese! Third commandment: Thou shall use “a hunk of well-ground, good-quality Beef” sounds obvious but you can find yourself lost with possibilities. When all else fails, grab the 80/20 blend of ground beef at your local grocery story as you want the meat to have a lot of fat. For this cook, my friends at The Organic Butcher of McLean took care of me with their custom blend of brisket, short rib, and hanger steak. Once you have a custom blend of ground beef like this you will never go back! Fourth commandment: Thou shall use processed meltable cheese. This one takes a lot of trial and error to learn because the tendency is to overcomplicate the burger with fancy cheeses like gouda, blue, etc. Using a processed cheese like American Cheese produces superior cheese melting every single time! Sixth commandment: Thou shall keep things symmetrical is key when constructing your burger. You want the experience to be consistent with every bite allowing the person eating to have the full impact of the flavors you put together. Seventh commandment: Thou shall not use condiments outside of ketchup and mayo (if you insist) is a tough one for me. First of all, a burger isn’t a burger without mayonnaise so I do indeed insist. 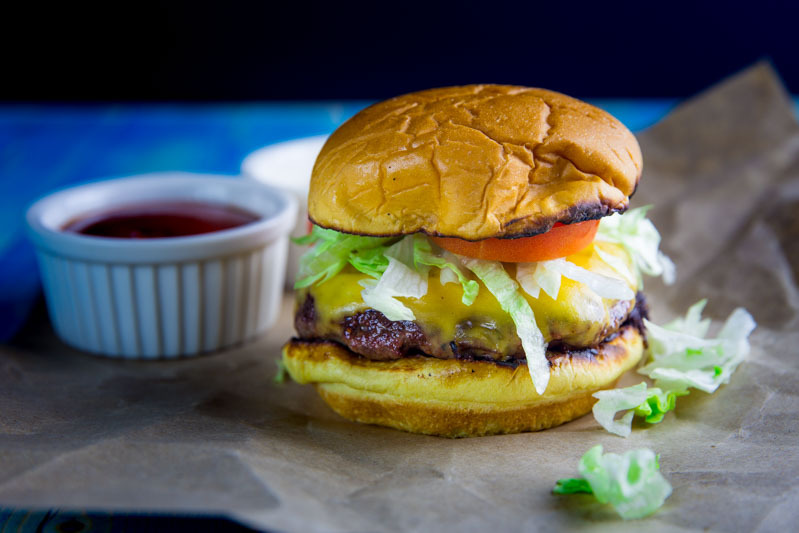 However, the measure of a truly good burger is one where you do not need any condiments and the flavor of the meat, cheese, bun, and toppings do all the work. Eighth commandment: Thou shall keep clean while eating is one that is easily met if you have followed the previous seven commandments. When you start adding a fried egg, chili, etc. to your burger it is nearly impossible to stay clean. Ninth commandment: Thou shall consider bacon… maybe. Well, I can assure you removing the “maybe” is always a good idea because bacon makes everything better. Just remember balance is the key. If you add bacon do so in a way that gives you a bacon bite with every bite you take of the burger. Tenth commandment: Thou shall not have a burger that’s difficult to eat is an easy one to achieve if you have followed the nine commandments preceding this one. In other words, no knives and forks with your burger. Now that we have walked through Anthony Bourdain’s commandments, let’s turn our focus to my Big Green Egg Cheeseburger Throwdown. This post was an experiment to create a perfect burger following these ten commandments and then cook another burger recipe to challenge them side by side. In essence, I competed against myself “throwdown” style knowing there would be no losers here. First, I set the Big Green Egg to 600° and placed a cast iron insert inside to help get that perfect crust on the hamburger patties. After the BGE reached temp, I cooked the burgers for 2 minutes per side to get a perfect medium rare center. Once the first side was cooked, I flipped the burgers, added the cheese, and kept the dome closed allowing the cheese to melt. For both burger patties, I used Sucklebuster’s SPG rub in the meat mixture to add a richer flavor with a combination of Salt, Pepper, and Garlic. For the competing burger, I used a Guy Fieri recipe for Straight-Up with a Pig Patty Burger. This recipe does something unique bacon that I have not seen before. I boiled the bacon until tender, then cooled the bacon, and finally formed patties (or Pig Patties) to grill on the cast iron griddle. This technique produced some of the crispiest bacon I have eaten! The “Donkey Sauce” featured has mayo, mustard, roasted garlic, Worcestershire sauce, salt, and pepper in it. Well balanced and delicious! In the final analysis, there was no clear winner as both burgers were amazing. The use of a custom burger blend made all the difference in the world. I look forward to my next round of burgers after this cook as there are always new things to try and improve.